The smell of vomit in a carpet will live on forever if you don't do something to remove it. Avoid the toxic chemical fumes of commercial odor removers. Use the natural ingredients you likely already have in your home to completely remove the odor once and for all. Your family and pets will thank you. 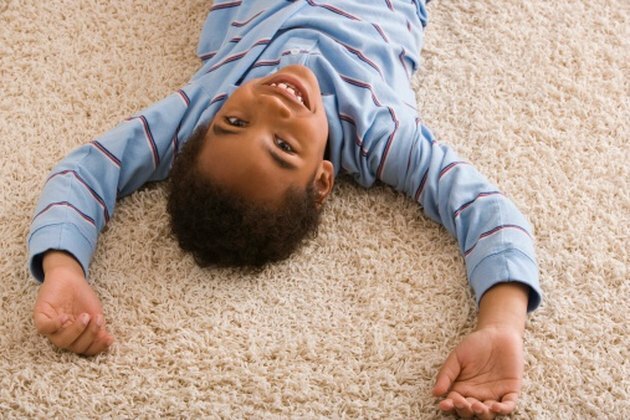 Deep carpeting with thick padding may need two or three treatments. Clean up all the vomit you can with a damp cloth. Sprinkle baking soda liberally over the area. Pour white vinegar over the baking soda. The mixture will bubble up and break down the proteins that cause the odor. Allow to soak in for 5 minutes. Scrub the area vigorously with a clean towel. Rinse out the towel and scrub again. Let the area dry. If the smell persists, repeat the procedure until the smell comes out. Deep carpets with thick padding may require two or more applications.